Winemaker’s Notes: Pale yellow with green hues. Elegant aromas of tropical fruits, green apple, pear, banana, and pineapple. Honey and a hint of citrus notes. Dry white medium-bodied wine. Well-balanced, pleasant and long lasting finish. My Review: Oh Chardonnay, you hard sell. I’ll admit that I was a bit excited about this one – it’s been a while since I had Santa Julia wine, and in the past I’ve always enjoyed it. On top of that, stainless steel is about the only way I can get my wife to let me open a bottle of Chardonnay in her presence. So what did I have to lose? Well…. In the glass the wine yellow in color, though it skewed more to the golden side than pale yellow. Not full gold, but definitely more dandelion or goldenrod. On the nose I picked up aromas of tropical fruit and green apple. In the mouth the wine was dry and medium-bodied, with flavors of citrus and apple, and a roundness that hinted at oak even though the wine was aged in stainless steel. My wife and I just sipped on the wine, but I think a nice seafood-based pasta dish (shrimp scampi or even alfredo) would be a nice pairing, though something with a bit of acid to balance the slight roundness of the wine would be in order as well if you didn’t want to play up those notes. 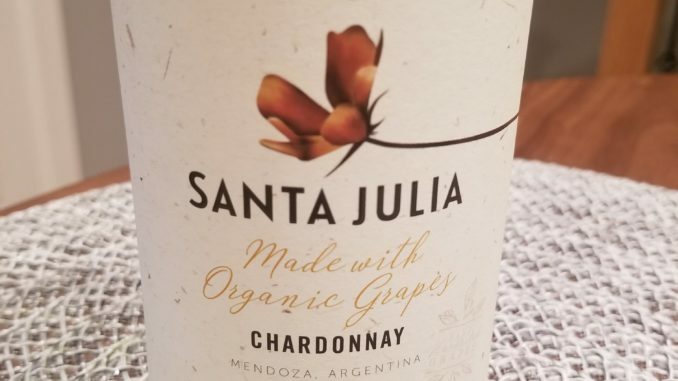 For $11 I didn’t dislike the wine, but any Chardonnay that even pretends like it’s been oaked is a hard sell in my house, so I doubt this is one I would pick up again without it being for just me. Still, if you want a Chardonnay with a hint of body (not not too much), this is a good value pick up for a Wednesday night.